Remember Memebox? They used to send out a bunch of full-sized Korean beauty products for around $35-ish, including worldwide shipping, before everything went kaput. Ever since I read The Japanese Skincare Revolution: How to Have the Most Beautiful Skin of Your Life by Chizu Saeki (READ IT NOW! ), I've been obsessed with J-beauty (and K-beauty). Japanese beauty subscription No Makeup No Life reminds me of Memebox in its halcyon days. For starters, the products are full-sized. For another, the box, inclusive of worldwide shipping, costs $29.99 a month. 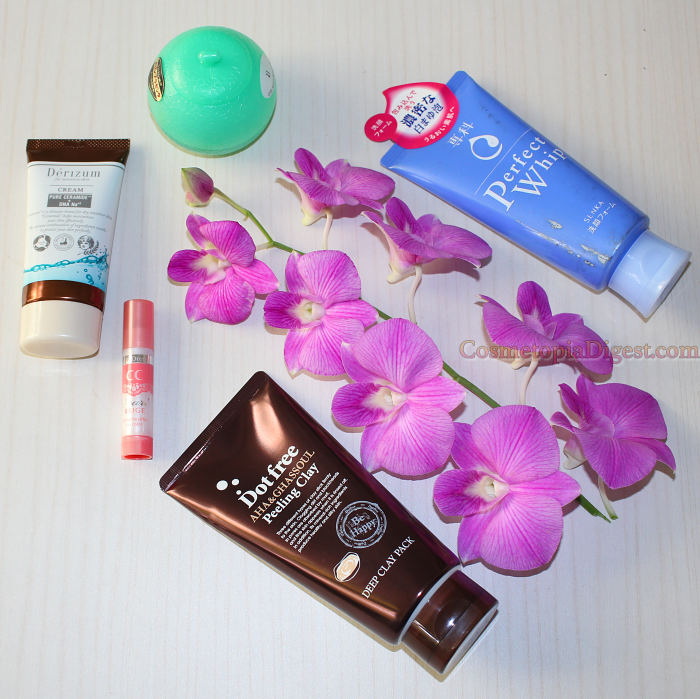 Thirdly, like Memebox, the contents veer towards skincare. Just the way I like. Also, the product card (a booklet here) comes in English, so you are not perplexed by the Japanese labels. Finally, they reveal the entire contents of the box beforehand. No surprises, nasty or otherwise, to be had. I have the April 2017 NMNL beauty box to show you. It is themed "Skincare Essentials". The external box arrived so battered - mutilated - in the post that I could be forgiven for assuming that the Mother of All Bombs and the Father of All Bombs faced each other in mortal combat within the box. This did not - thankfully - take away from the contents, except for a minor leak and a soggy product booklet, about which I have just informed customer service. 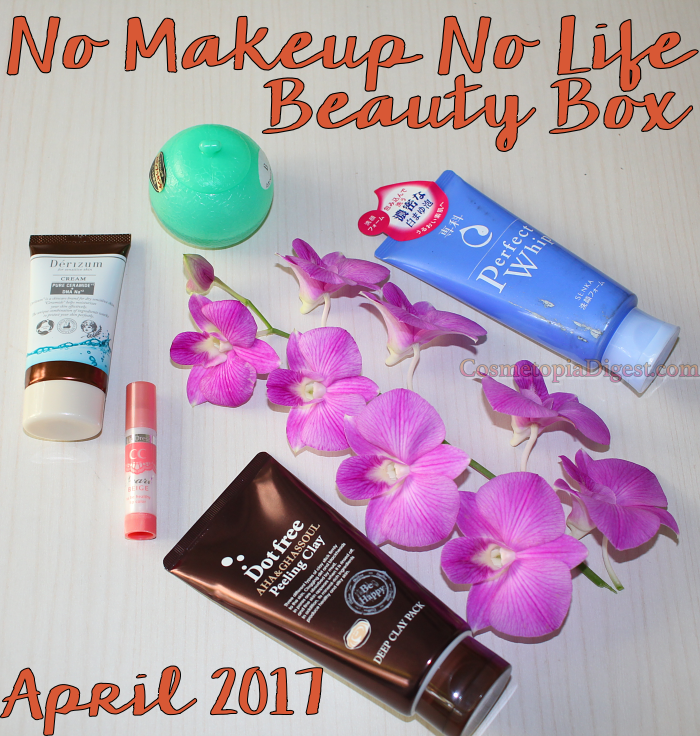 Scroll down for the review of the April 2017 No Makeup No Life Beauty Box, a Japanese monthly subscription that ships worldwide. Everything is full-sized, and expiry dates are far off. There's a cleanser, a mask, an all-in-one, and a hydrating cream, and a lip care product. A comprehensive (if a tad quick for me) skincare routine. Shiseido in the Far East is COMPLETELY different from the brand's products we find elsewhere. I had the shock of my life when I saw the dedicated, colourful Shiseido counters in Malaysia and Singapore, where the brand owns a whole gamut of sub-brands. Such as this one. A gentle cream cleanser, and a welcome addition to my ever-expanding cleansing wardrobe. That's not dirt at the side of the tube; that is where the soaked product booklet was stuck to this tube. This one leaked in transit, as you can see from the quantity left - there's just about enough for me to get a good idea of what this product is like. 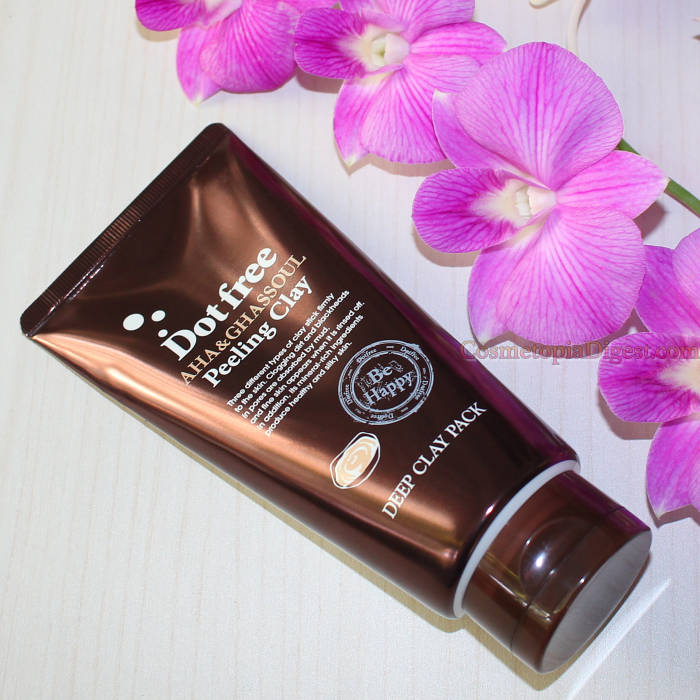 It is a multi-tasker - it functions as toner, essence, moisturiser and a base. The finish reminds me a lot of the Mizon Snail AIO, though the Melon AIO is clear and very gelatinous. 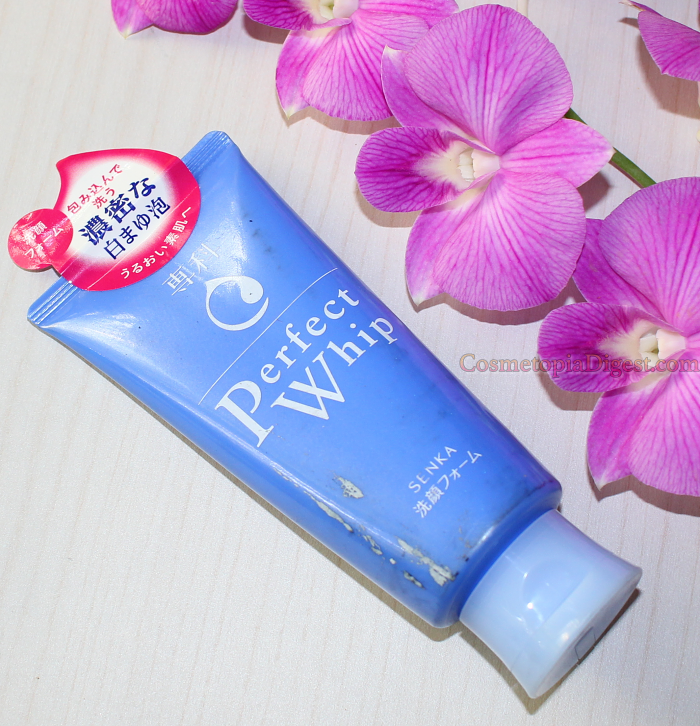 It dries equally matte and the skin feels firmer, tacky and moist. This gel is rich in hyaluronic acid, fruit enzymes, and amino acids. This ceramide-rich cream contains 3,000mg of hyaluronic acid. It is an ideal last-step, or penultimate layer (before a sleeping pack) in my 10-step skincare routine. Clay, charcoal and Alpha-Hydroxy fruit acids come together in this decongesting face mask. 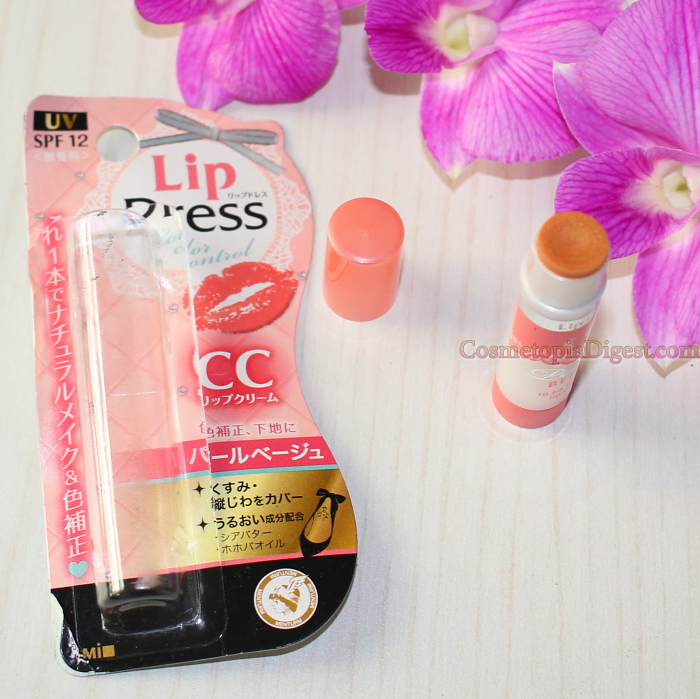 A lip balm with SPF12, in a sheer tint - this is a CC (colour corrector) balm for the lips. It it unscented and unflavoured; on me, there is the faintest peachy shimmer. One day, I want to go to Japan - with a stopover in South Korea - and come back with a few suitcases of skincare. Just imagine - all those products on supermarket racks, at competitive prices. About this box - a huge winner for me. The products fit the skincare theme to a T. I'm a skincare junkie, and there is everything from a cleanser to a multitasker, finishing moisturiser, and lip care. I would have loved to see sunscreen, but maybe we will find some in forthcoming boxes, as the weather warms up? Japanese sunscreens are supposed to be the best for both UVA as well as UVB. For $29.99 inclusive of international shipping, this is a great deal - you only pay $6 per full-sized product. It looks like the NMNL box will feature regularly on this skincare-junkie's blog. May's NMNL box is themed "Beauty Must-Haves" - that has a lot of potential, and I look forward to seeing the contents. Stay tuned for more! There is a generous giveaway here, with 10 NMNL boxes up for grabs, for 10 winners - it is open worldwide. Do go enter - not much to be done; one of the entries is to visit their website. Perhaps you'll get your first NMNL box free! Or, you can subscribe here. Right now, there is an ongoing 10% off FOREVER code in honour of their anniversary - it is 2NDANNIV.